Simon Bolivars Birthday in Venezuela always falls on July 24th each year and is a national holiday celebrating his role in bringing independence to Venezuela from the Spanish Empire. People will spend the day relaxing with family and friends enjoying the day off. 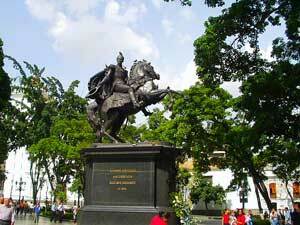 Some will pay their respects to different statues and public grounds dedicated to Simon Bolivar. This day is a national holiday with government and business offices closed. Throughout most of South America Simon Bolivar is considered "El Libertador", the liberator because of his role in removing Spanish power from the America's. In 1813 he was calendar command of the Patriot army the liberated Caracas and later led many different armies of many different South American countries to victory over the Spanish Empire.